The churchwardens’ accounts show us that many people from the community were involved in the upkeep of the church. St Michael’s has never been a church which has relied on the support of one or two families. Since the 1660’s churchwardens have been tradespersons such as shoemakers, millers and tailors. Some things never change. In 1665 the church paid 6s 3 d for the repair of the gutter between the two naves. 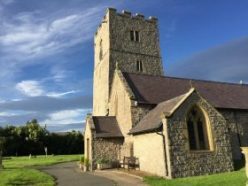 In 2016 the church paid for the same repair– but rather more than 6s 3d! Sometime in the late 17th or 18th century a wooden gallery was installed along the West wall, below what is now the Eisteddfod window. The churchwarden’s accounts include two payments for reeds for the bassoon! Box pews were installed, with panelled doors, some dated. Local families purchased their pews, and there is still the nameplate of one, Sir Thomas Mostyn Bart on the wall. 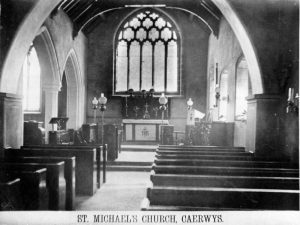 Although Caerwys was in a period of decline in the early 19th Century, the church continued to play a prominent role. Rev’d Richard Richards was Rector from 1816-1849. He was a powerful preacher, and a very popular figure. Many local churches were neglected during the eighteenth and early nineteenth centuries, but there is evidence that St Michael’s was cared for. In 1813 a National School was opened in Caerwys. It was, effectively, a church school. The second half of the nineteenth century saw the growth of chapels of several denominations in Caerwys. The issue of the payment of the tithe tax to the Rector became increasingly bitter, and there were significant confrontations in Caerwys and locally. In 1891 the Tithe Act transferred the responsibility for payment of the tithe to the owner of the land rather than the occupier, and issue receded . In 1896 a major programme of repairs and re-ordering was started with the help of a small grant from the church authorities. In 1894 a major renovation of the church was begun. The whole east wall was reconstructed. The medieval stained glass in one of the windows was removed, and re-fitted in a ‘jigsaw’ of fragments in a window in the chancel in the south wall. The rood screen was removed and the altar raised on a step. The gallery was removed, as were the box pews. Barely ten years later, there was a second major restoration under the direction of Rev J Francis Reece. Dry rot had affected the flooring, roof timbers and some of the pews. It was at this time that the doors from the box pews removed in 1896 were installed as a dado around the walls on the church, where they can be seen today. This restoration saw the installation of concrete floors, and the construction of a low wooden screen around the chancel on to which carvings from medieval times had been fixed.